Hi Everyone, Jenny here! I’ve been playing with the April Hedgehog Hollow Box and came up with this simple but sweet design for a card, which is great for having a little practice at Copic coloring, and quick to make for those ‘I need a card’ moments! 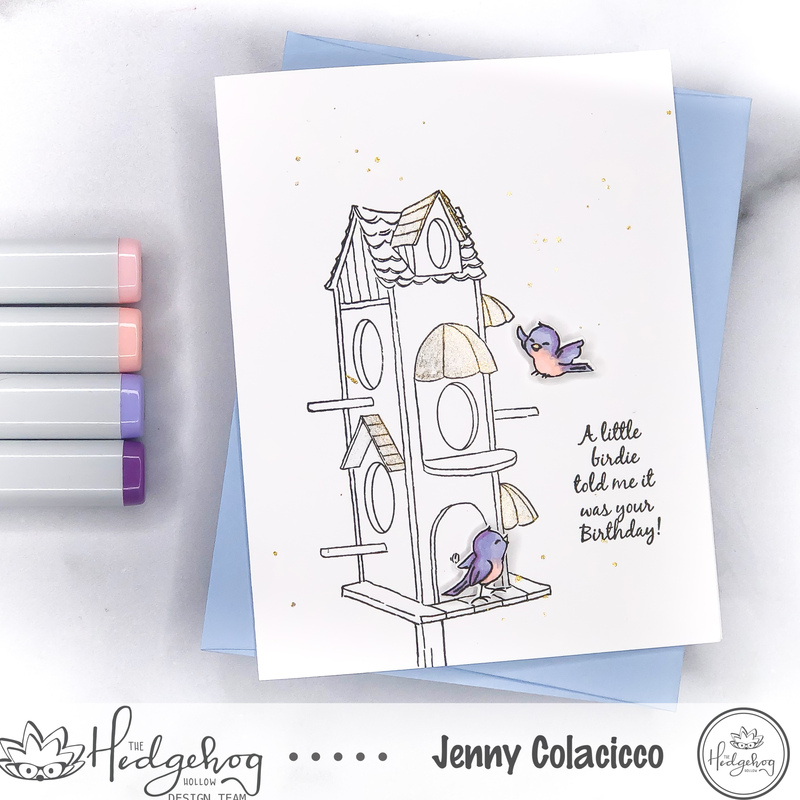 To create my card, I stamped the Art Impressions bird house from the box directly to a card base (included in the box) in Nuvo Black Shadow ink (from the box), as well as one of the sentiments from the stamp set. I also stamped a couple of the cute little birds on a separate piece of Copic friendly cardstock. I did some very simple coloring on the birds with my Copics, with two shades of RV for the head and wings/tail, and two shades of R for the tummy. These colors co-ordinate really well with the blue envelopes in the box. I then die-cut them out and popped them on foam tape on the bird house. 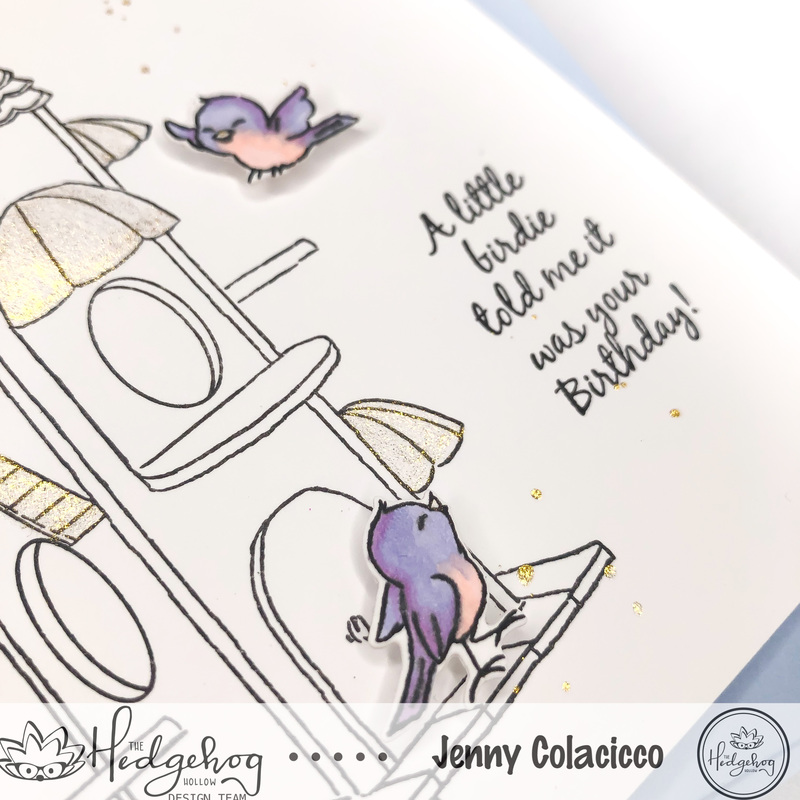 To add some sparkle, I used the Midas Touch Nuvo Shimmer Pen to color in the bird house roofs / awnings, and I also squirted some of the shimmer to the tip of the pen and flicked on some splatters (carefully). As a finishing touch I added a touch of the shimmer pen to the birds beaks. And that’s it! Super simple, and great fun to make! I have lots more coming up featuring the April box so stay tuned!